Today I wanna talk about some positive things that we can all relate to: eating delicious goodies, de-stressing, and family fun! Ok, that sounds really cheesy, but hear me out. The holidays can be hectic in most homes. Families have freak-outs. Pets get stressed. We all need emotional and physical releases, right? So why not eat goodies, have fun, and de-stress all at the same time … Together?!? That’s what we do in our dojo. This short post serves to show you how to do just that! I know I can get wordy, but don’t worry; this will be a short post. There are some fun videos in here, so grab your pup, parrot, pussycat, or piglet and get ready to try something new! We see them everywhere. Those plush, adorable, colorful stocking stuffers. They seem to be literally everywhere we look this time of year. I have to admit; they are hard to pass up. We used to give our canine companion all kinds of stuffed toys for Christmas. Most of my clients and family offer them to their pups as well. There’s nothing inherently wrong with it, but it can pose a danger. No matter how adorable that stuffed dog toy is, chances are, some part of it will wind up inside your dog. Hopefully it will make it’s way out the other end. But sometimes it doesn’t make it out. I have a suggestion. This holiday season, instead of offering them the usual stuffed toy, consider offering your companion animals something REAL. -Something they would choose over and over again, if given the choice. Consider offering your animal companion something more natural, and more to their liking. Stuff their stockings with a new treat this year! The safest and healthiest option is to offer what your omnivore or carnivore really wants: Stuffed Body Parts. Hear me out, before you get totally grossed out. Body Parts are Natural Chews. You can view some of the ones we use here: BODY PARTS (aka Natural Chews) . As they state, it’s nothing but the good stuff! No preservatives, salt, wheat, corn, or sugar! Nothing that has ever been on the continent of Asia. No rawhide. They are easily digestible and safe for all ages. And the animals absolutely love them! But we don’t just offer those natural chews, willy nilly. We stuff and freeze them. It makes them last much longer, and it’s a tool that we use to modify behavior, prevent problem behaviors, and tap into their innate instinct to CHEW! If that video was too fast for you to see how to create these stuffed chews, here is another video of me making one, but with a Kong. If you still have to get gifts or stocking stuffers for the animal companions in your life, consider skipping the toys filled with cotton stuffing. They are quickly and easily “disemboweled”. They often end up going in one end of the dog and end up (hopefully!) coming out the other. In the pic below is one example of me coming home to see that Hocus Pocus had disemboweled her stuffed toys, beds, and other items when she was a wee lass. (a very common result from boredom and frustration). And of course, King Albert was there on standby watching the storm. Instead of offering toys filled with cotton or polyester stuffing, consider gifting them REAL, natural goodies such as organic raw bones, yummy natural high-protein treats, and stimulating puzzle toys and Kongs! They last much longer than the usual stuffed toy, and they encourage natural canine chewing and foraging behaviors. The same goes for your feline family members. Cats are predators. Period. Portions of their natural diet consists of hard bones. Those lizards, birds, snakes, and frogs aren’t filled with air, folks. Even if your cat lives indoors, he/she still craves these things. And they are healthy tools! Bones clean tartar and help to maintain healthy teeth and gums. Since most indoor cats don’t have access to bones, veterinarians recommend them as a treat. But, be careful not to give your cat pork, chicken or fish bones. These could splinter and cause severe internal injures. Raw bones are also better than cooked ones, since they are less likely to splinter. Clearly this is an exaggeration, but cats DO love bones! Tooth decay and gum disease have been linked to heart, kidney, and other serious chronic illnesses in cats. Many cats do not show obvious signs of discomfort until they’re in considerable pain. Don’t wait until your cat shows signs of distress to have his teeth checked out. Start now by offering them healthy, safe chew items. Always consult your feline veterinarian. You can also view Knox enjoying a raw bone in this video (here)! I get it; the idea seems gross to most. Being a borderline vegan-vegetarian, I understand. But I used to be a zookeeper, so I am well desensitized to all of this. – Crocodiles, lions, tigers, komodos, and jaguars ate whole carcasses! It’s natural. Our feline family members may chill on our couches, but they are not far removed from their wild ancestors; they need these items in their diet. If you don’t believe me, check out what the experts have to say. If you are completely incapable of even considering the idea of offering stuffed body parts to your pets, at least consider offering them toys that tap into their natural instincts! I have written about this topic at great length before; cats need to have outlets to express their natural behaviors! If there’s a cat on your Christmas gift list, go for toys that stimulate his hunting instincts! Or how about a new stimulating scratching surface? You can also consider a toy that allows you to interact with him and gives him some exercise at the same time, like a laser beam toy (that always ends with a food reward) or a feather teaser like Da Bird. Consider toys that stimulate their natural instincts! Offer a toy that allows your kitty or ferret to chase and hunt! Offer a new “approved” scratching surface, window seat, or cat tower! Consider getting your cat a toy that allows you to interact with him or her, while giving your feline friend some exercise at the same time. If you need some ideas, HausPanther has a new 2017 Holiday Gift Guide for Cats and their people! This holiday season is an opportunity for you to give them this gift! Let’s not forget our feathered friends this holiday season! But don’t let those flirtatious faces and colorful feathers fool you. Parrots are not domesticated animals. Cats, dogs, and horses have been selectively bred for qualities that enable them to live more harmoniously among humans. Parrots are exotic, and by definition, are not a species indigenous to the U.S. Companion parrots have the same instinctual needs as their wild counterparts. Your parrot may live in a cage at home with you, but his mind and body are just as wild as the green-winged macaw that’s flying free in the tropical rainforests of Central and South America. Parrots bred in captivity have the same instinctive physical and behavioral needs of parrots living in the wild. Offering natural chews helps them to better adapt to life in captivity! Interactive Toys Are a Necessity! For companion animals, and all exotic animals in captivity, toys are not a luxury, but a necessity. Interactive Toys are vital to their well-being. They prevent boredom and frustration when you have to leave your companion alone at home. They provide comfort when they need it. They are a great outlet for excessive energy! Toys can even help prevent your pup, pussycat, parrot, pig, or poison dart from from developing unwanted/unhealthy “problem” behaviors. If there’s a feline, canine, parrot or ferret on your holiday gift list, get real and go natural this year! Regardless of what natural item you offer as a gift this year, remember that we need to be particularly careful when monitoring playtime to prevent any “unauthorized” activities and to ensure safety. Always monitor the animal when they are exploring, eating, or playing with these new items. Don’ts for Dogs and Cats —> check out this important link! … considering the high number of unhealthy pets in homes, increasing behavioral problems, and animals surrendered to shelters every week, I say we aren’t doing enough enrichment. But we can change this. And when we do it will shift everything. Not only will we shift the energy within the animal, which will result in healthier bodies and minds, but we will create a more empowered way of living for each animal within the home. We will also shift the energy between guardians and the animals. So as you are out and about this holiday season, consider how you can offer a unique experience for you and your animal family members. Think outside the box! Create fun and long-lasting memories that will enrich everyone’s lives! “Then the Grinch thought of something he hadn’t before! What if Christmas, he thought, doesn’t come from a store. What if Christmas… perhaps… means a little bit more!” ― Dr. Seuss, How the Grinch Stole Christmas! Boxing Day is Everyday for Cats After Christmas! Many people around the world are celebrating Boxing Day today! Different countries celebrate this annual event with their personal heritage and traditions. No matter the stage, size or species, all cats love boxes. Whether they are a tiger or tabby, a kitten or senior, a Good Box Makes Life Better. 📦 Not only are boxes perfect for cats, who are both Predator AND Prey, but experts believe a cardboard box is just as important as food, water, and a litter box! 📦 Cardboard is insulating! It helps to maintain their body temperature in both hot and cold environments. 📦 Boxes offer much needed mental and physical stimulation for cats, while providing safe places of refuge and security. Senior & Geriatric Cats need low-sided boxes. Cardboard is insulating for cats! When a cat burrows down into a box, the cardboard assists in maintaining the cat’s body temperature. This is how cats maintain their “thermal neutral zone”; cats can more easily maintain their body temperature without having to expend a lot of precious energy. Boxes can also be used for Stationing! 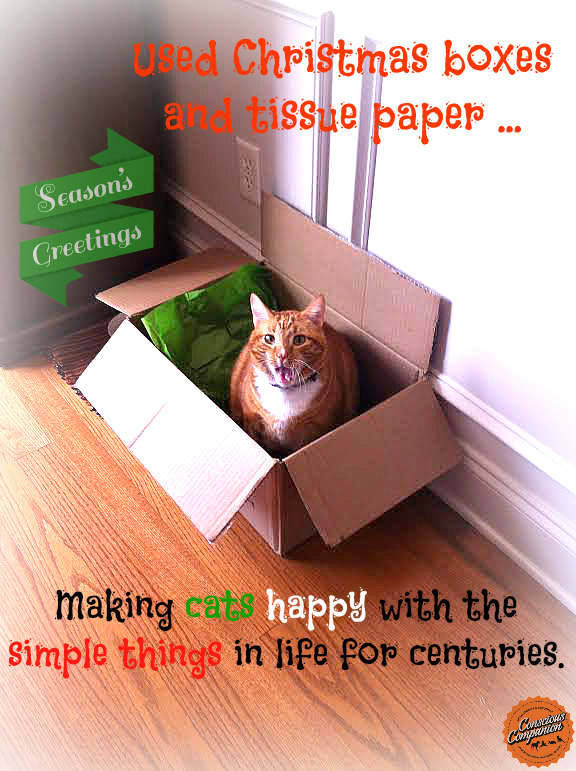 Rather than tossing out all of the tissue paper and boxes after the Christmas commotion, consider offering your feline family member a great box! Giving your cat a box not only helps him/her, but is also a cool way to recycle. Learn more at our Website! It’s More Than Just A Box! Lions! Tigers! Leopards and Boxes! Oh My! Rocky, my brother’s adolescent cat enjoying a deep, high-sided box after playtime. Boxes should be sized appropriately for each cat’s age and stage in life. If you are a last minute holiday shopper, you may be tempted to buy Christmas or New Year gifts for loved ones without doing your homework. This time of year, parents and partners can be easily persuaded to get the most heart-warming gift of them all: a cute and cuddly new animal. It may seem like the sweetest gift idea, but often it is not most responsible decision. Animals are unlike any other present. They require a level of commitment and responsibility that few other holiday gifts do. Often because people fail to recognize this, countless dogs, cats, birds, and other animals given as gifts during the holidays end up at animal shelters shortly after the New Year, facing a very uncertain future. An animal gifted as a present isn’t a Christmas Day gift, it is a life-long commitment. Let’s be clear here. It’s not a gift for your life, but their life. Thinking of getting that teeny, tiny, adorable tortoise? Are you ready to ensure its care for well over a hundred years? Do you want a dazzling parrot? You can plan on 60 to even 100 years of care. Even aquatic turtles live over 30 years of age. The average lifespan of a cat is 13 – 17 years. A dog’s average lifespan is 10 to 13 years. Are you ready to dedicate yourself to this animal for that long? Animals are not just pets. They are family members for life. Ask yourself another tough question. Have you considered the extent of responsibility, time, care, expenses, education, commitment, and love that this one animal will require? These responsibilities last far past Christmas day. Take the time and do your homework on what exactly is involved by adding an animal companion to your lifestyle. Let’s take dogs for example. When you decide to bring home a new canine companion, please understand that you are making a commitment for the entirety of that dog’s life. So many people that have the best intentions rush this very important and life-long decision. The honest and informative graphic below from The Uncommon Dog should help you and your family decide if you are truly ready to welcome a dog into your home at Christmas Time. When the kids, wife, husband, or partner pleads for a new adorable pet, answer their request with a realistic question: “Are you fully committed to this soul for its life?” If either of you cannot answer with an unequivocal yes, then you might want to reconsider. Parents, no matter how well intentioned your child may seem about caring for a new animal family member, the reality is that you will inevitably end up being the true caretaker of that animal. Deciding to give your son or daughter that puppy or kitten that he or she has been asking for is really a decision made by the adult, to add another living, breathing, needing member of your family – for which you, the parent will be ultimately responsible. It’s not quite the same, or as easy as investing in an iPad. Joining Petfinder’s Foster a Lonely Pet for the holidays program. You can give a shelter dog or cat a much-needed break from the stress of shelter life. Donate to an animal fund such as Heifer at Hanukkah or Heifer International With gifts of livestock and training, Heifer projects help families improve their nutrition and generate income in sustainable ways. Donating in-kind goods; many shelters need used blankets, sheets, and towels to make the animals more comfortable. They often need food, toys, and medical supplies. Call or check online to see your shelter’s “wish list” items. Make a donation to your local shelter or local humane society. Start an animal food drive. This can be for an animal food bank in your community, or in conjunction with other charity drives that may be taking place through your work, house of worship, or other organization. Give an animal reading to a loved one. When you give the gift of an animal communication reading, you are giving to the person and the animal! Think outside the animal gift box. Find another creative, thoughtful way to show your love this season.